Carribean athletes are warming up to be ready for Beijing’s World Championships, and the competition is really high. Usain Bolt, even if has a wild card for the world champs as last winner, decided to run at Jamaican Trials this week-end in order to test his shape after his not so brilliant previous competitions in both 100m and 200m. 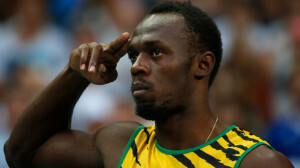 Rumors say Bolt will be on the starting line only in 100m, beginning with the heats on Tuesday till the final on Friday. If all follow the plans, Bolt could meet on the road to the victory some others gods of jamaican sprint: Asafa Powell and Yohan Blake, who seems recovered from latest injuries. This will not be an easy task for the world record holder: his opponents registered very fast times, in particolar his team mate Powell or, globally speaking, Justin Gatlin from US, this year leader. We’ll see what Usain Bolt is capable of, but don’t forget Lightning Bolt never disappointed in big competitions, pulling out of the hat incredible performances.